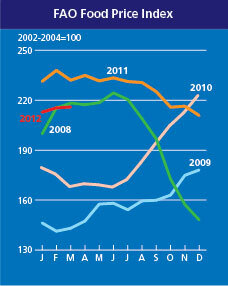 The FAO food price index for 2013 October which includes the calculation and measurement changes. Spot the differences? I can’t. 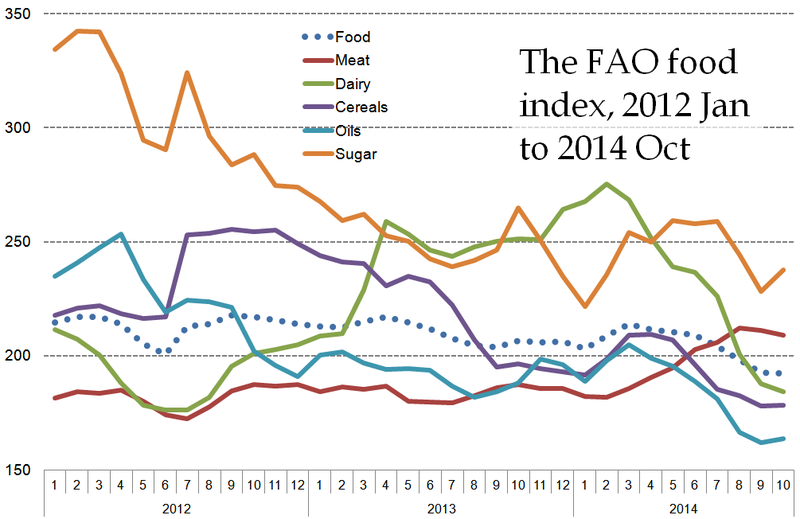 Why has the Food and Agriculture Organisation (FAO) changed the way it calculates the monthly FAO Food Price Index? 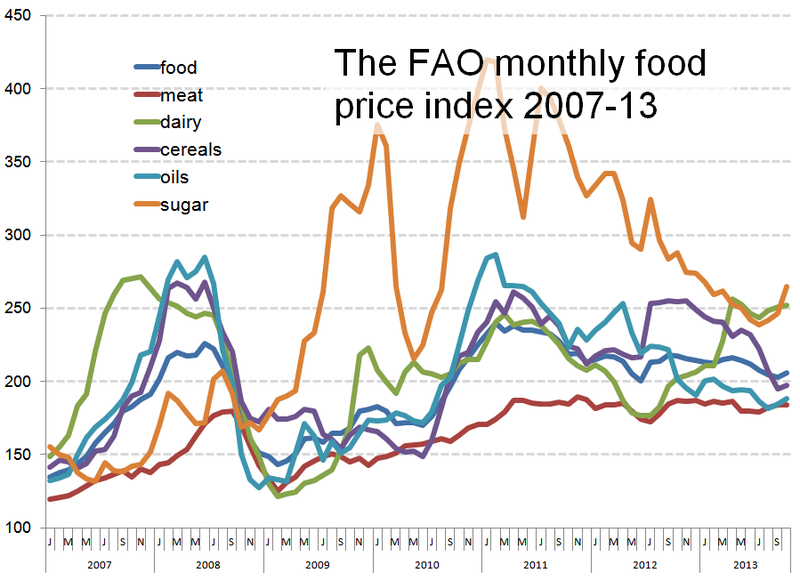 But hold on, let us scrutinise first what the FAO Food Price Index is for 2013 October. 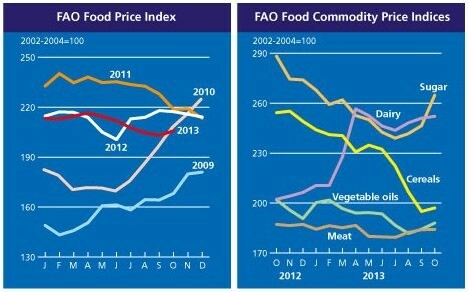 In substance, this sort of commentary for the FAO monthly food price index barely differs from the standard tedious template, in tone and tenor, that FAO has applied throughout 2013. 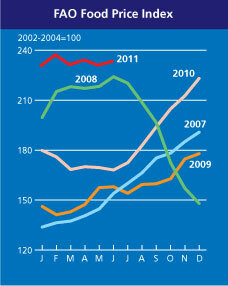 The tone has been, as we begin to close 2013, that food prices have not moved very much through the year, and the tenor has been that food price volatility is being reined in. 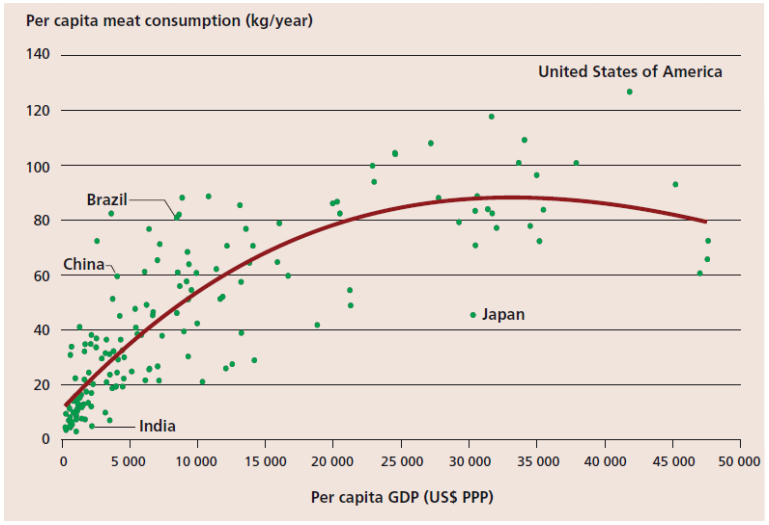 Based on the evidence provided by real prices I experience in India – real markets (or bazaars or mandis) in which real vendors sell actual produce to real household buyers – I have no idea what the FAO Food Price Index is talking about. 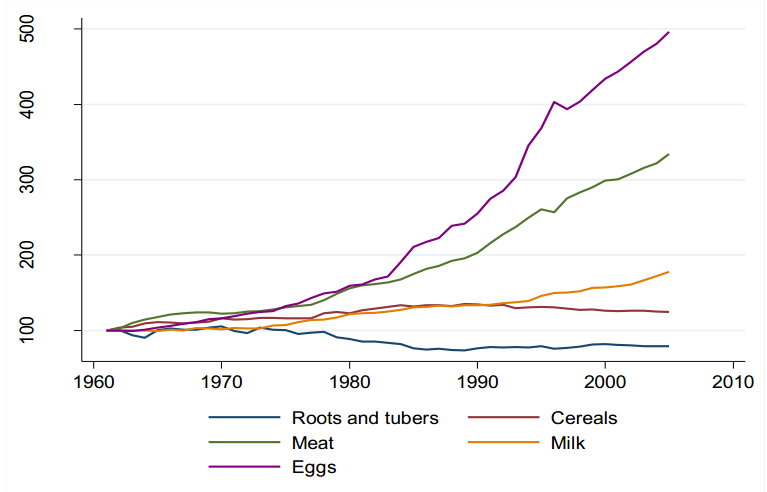 Nor do tens of millions of urban and rural households all over the world when they try and correlate the numbers of the FAO index to what they must confront every time they make a food purchase. 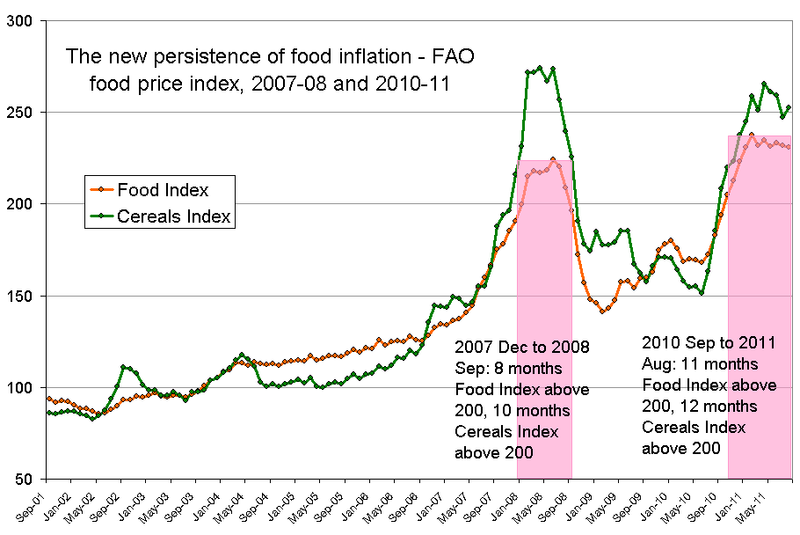 This is because of what the FAO Food Price Index measures which, I wearily point out, is a criticism levelled time and again. 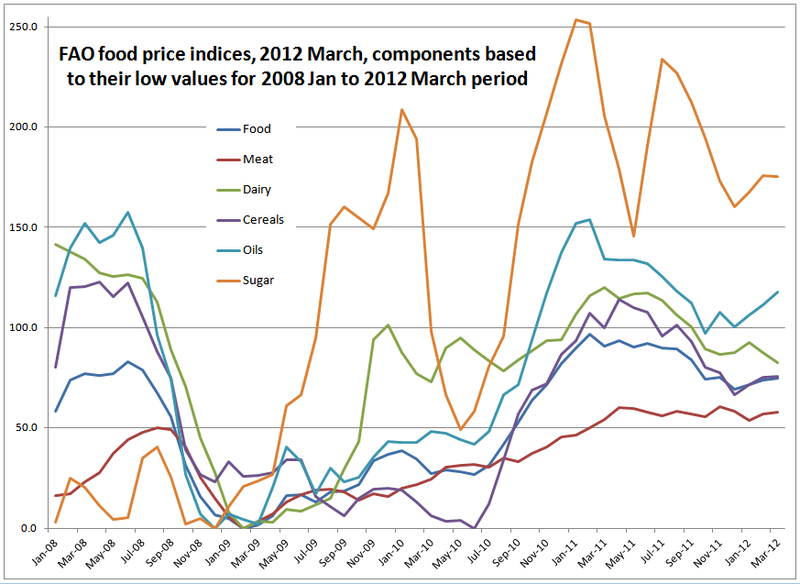 Why call it a food price index when it is in fact a food exporters’ and importers’ price indication? Impressive equations, but where’s the connection with the local markets you and me buy our veggies from? 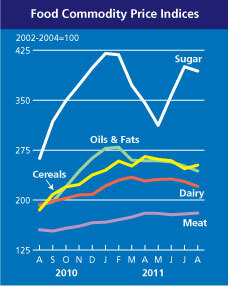 Now, with a change in its calculations, the FAO index includes the following 23 commodities: wheat (10 price quotations monitored and reported by the International Grains Council), maize (1 quotation) and rice (16 quotations) for cereals; butter, whole milk powder, skimmed milk powder (2 quotations for each) and cheese (1 quotation) for the dairy group; poultry (13 quotations), pig (6 quotations), bovine (7 quotations) and ovine (1 quotation) for the meat dairy group; sugar (1 quotation); the oils group consists of one oil price quotation for soybean, sunflower, rapeseed, groundnut, cotton seed, copra, palm kernel, palm, linseed and castor. 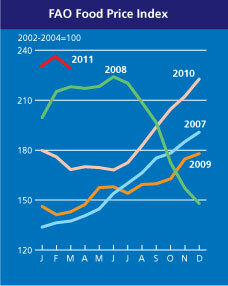 This construction, thus, includes the use of 73 price series. Perhaps. We will not know for another few months. If a change was needed that made sense to consuming households, then FAO should have ensured the index reflected what households pay for the food the buy in the markets near their homes. If the FAO must serve multiple audiences, then it must devise food price indexes for these audiences separately (but the IGC already serves the food traders, and FAO’s own Agricultural Market Information System already serves the policymakers and the major international blocs). 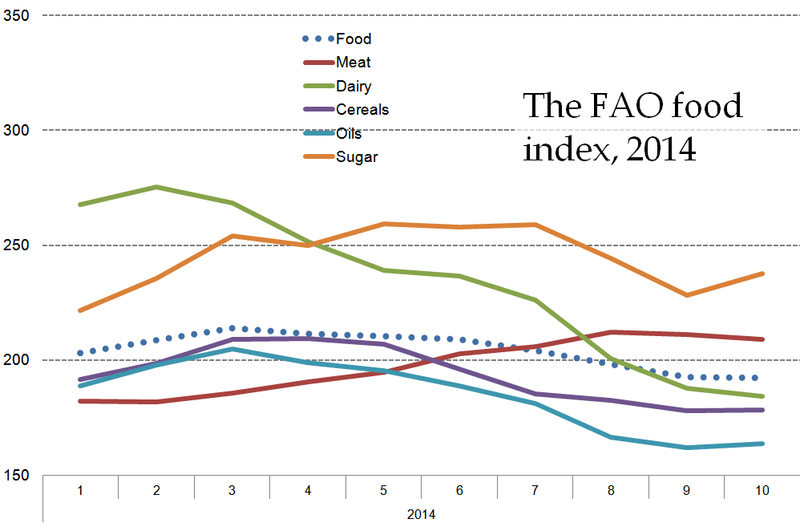 The FAO has released its latest food price index data, and the central message for this month is: little change from the last month. 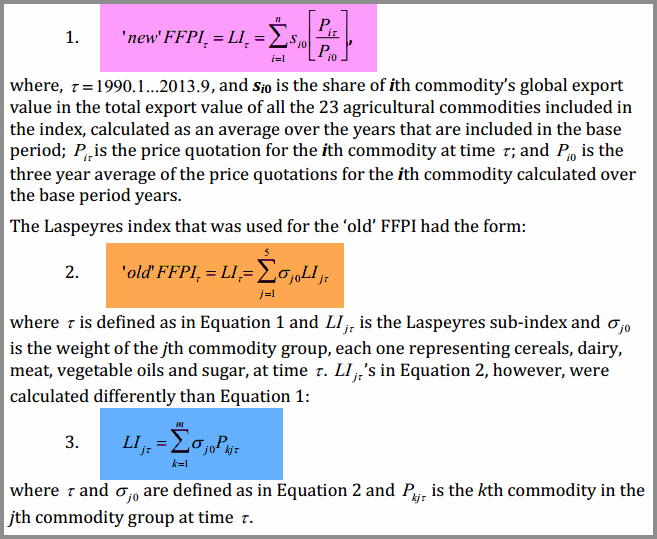 The question for us, as we read about and hear about steadily rising food price inflation in the countries of the South, is: why is the FAO food price index not capturing real inflation for these populations? 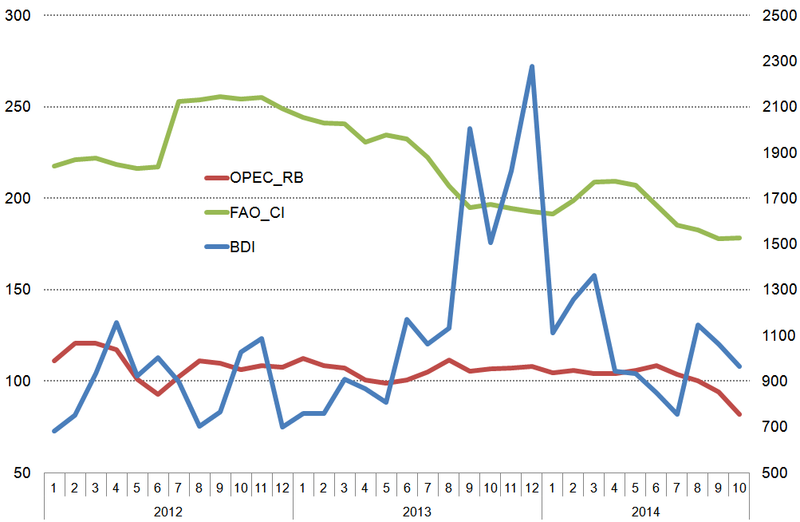 This chart is a way to rectify that lack. 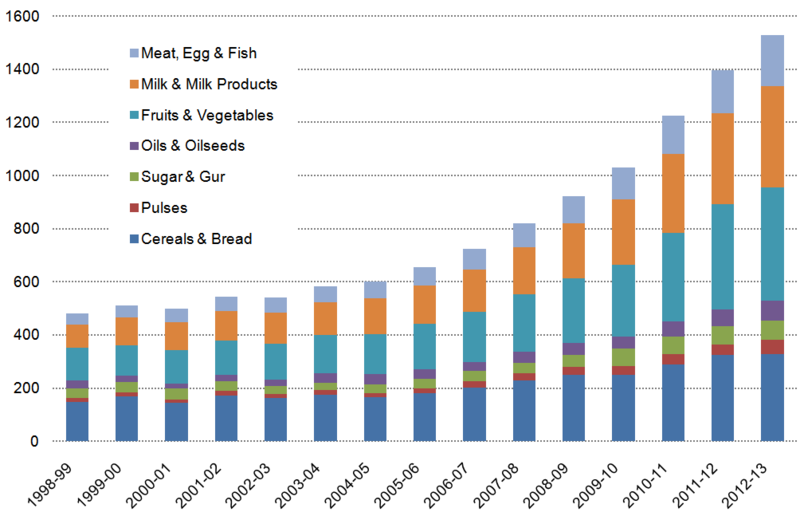 In this, I have used the index data as the composite (food) plus the components (meat, dairy, cereals, oils, sugar) directly from the data, but have re-based them. The familiar old blue panel. 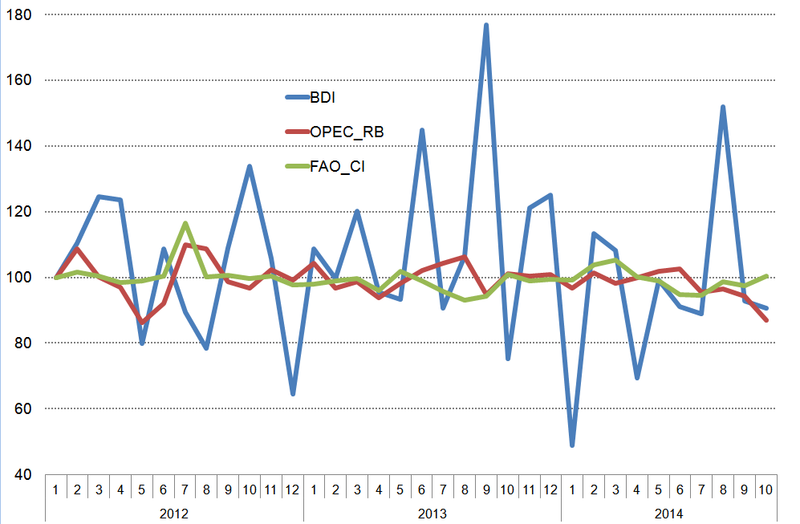 I have used the monthly data from 2008 January to 2012 March, and re-based them (six series) on each of their minima for the period. 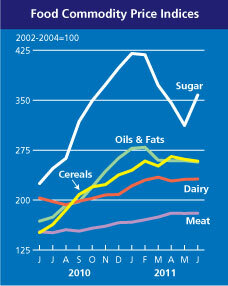 Thus, the minima are: Food, 141.3 in 2009 Feb; Meat, 120.4 in 2009 Feb; Dairy, 114.3 in 2009 Feb; Cereals, 151.2 in 2010 June; Oils, 127.3 in 2008 December; and Sugar, 166.7 in 2008 December. 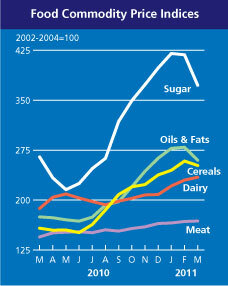 The current readings for all six series (2012 March) are: Food 215.9; Meat 178.2; Dairy 197.0; Cereals 227.0; Oils 244.9; Sugar 341.9. 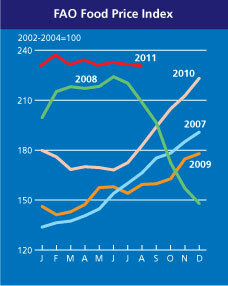 What this chart does is show the variation by month from the minimum for each series for the period. It is another way of looking at how the indices have moved from a point of low reference in the recent past, and to my mind is more evocative of the real situation in rural and urban food markets in the South.